When your baby gets sick, as difficult as it maybe for you to see them this way, Mee Mee can help make the process of giving medicines a whole lot easier with the Mee Mee's Accurate Medicine Dropper and Dispenser. 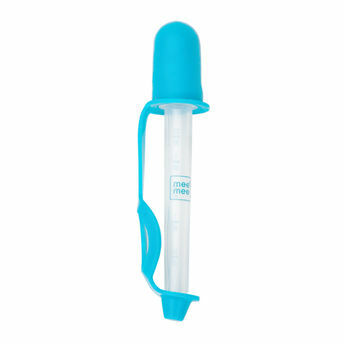 This has been carefully designed to provide the right measure of medicine every time in a quick and fuss-free way, preventing any accidental spit outs or staining around the little one's mouth. Conforms to International Safety Standards for hygienic reasons. Easy-to-read scale for convenient usage. The measuring jar holds up to 2 teaspoons (10ml) of medicine for ease of use. Protective cap is useful in protecting the dropper from germs and other harmful external conditions. Ensure that the dropper is clean before and after use for proper hygiene. You can easily clean all the parts of the dispenser with water and Mee Mee Liquid Cleanser. Store in a cool and dry place and make sure that the dropper is completely dry before use. Do not sterilize the pump of the medicine dropper.